Pigzilla (Pig Meteors) Mod is a new mod created by iChun. It is a simple mod that provides players with a lot of pigs falling down from a giant pink meteor into your world. This mod adds a block of compressed raw porkchops be be built with! Oinks when you place/punch/walk on it! It also adds a really big pig which can be ridden and steered with a carrot on a stick. Mod is not finished yet. The builds available is for Minecraft 1.7.2. Potentially laggy with all the block entities it spawns when the meteorite crashes down. Meteorites may not seem to spawn. This is a bug with Minecraft. If you eventually enter the chunk the meteorite is in, it’ll activate and cause destruction as intended. To ride Pigzilla you need to right click his bounding box between his feet, near the ground. NOT on his body. You cannot morph into Pigzilla. This is intentional. 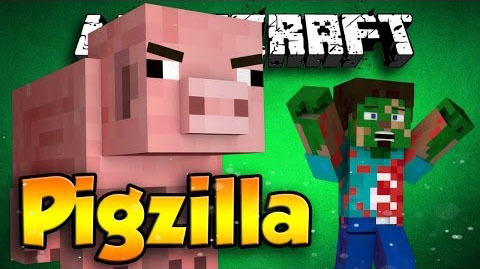 Pigzilla may get stuck in certain positions and he may carve a ring around his feet.